838 pages | 309 Color Illus. 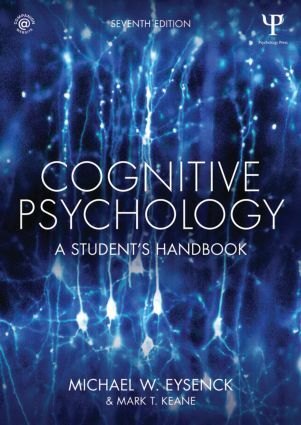 Cognitive Psychology: A Student’s Handbook will be essential reading for all undergraduate students of psychology. Those taking courses in computer science, education, linguistics, physiology, and medicine will also find it an invaluable resource. Preface. 1. Approaches to Human Cognition. Part 1. Visual Perception and Attention. 2. Basic Processes in Visual Cognition. 3. Object and Face Recognition. 4. Perception, Motion and Action. 5. Attention and Performance. Part 2. Memory. 6. Learning, Memory and Forgetting. 7. Long-Term Memory Systems. 8. Everyday Memory. Part 3. Language. 9. Reading and Speech Perception. 10. Language Comprehension. 11. Language Production. Part 4.: Thinking and Reasoning. 12. Problem Solving and Expertise. 13. Judgement and Decision Making. 14. Inductive and Deductive Reasoning. Part 5. Broadening Horizons. 15. Cognition and Emotion. 16. Consciousness. Glossary. References. Michael W. Eysenck is Professor Emeritus in Psychology at Royal Holloway, University of London. He is also a Professorial Fellow at Roehampton University. He is the best-selling author of a number of textbooks including Fundamentals of Cognition (2006), Memory (with Alan Baddeley and Michael Anderson, 2014) and Fundamentals of Psychology (2009). Mark T. Keane is Chair of Computer Science at University College Dublin.